Every year lakhs of Hindu Dharma devotees visit Holy Amarnath Cave and BSNL take part in providing network to make uninterrupted connectivity for mobile subscribers. BSNL on pilot project basis is to lay permanent Optic fiber cables along the route of Amarnath Yatra in Jammu and Kashmir Telecom Circle. 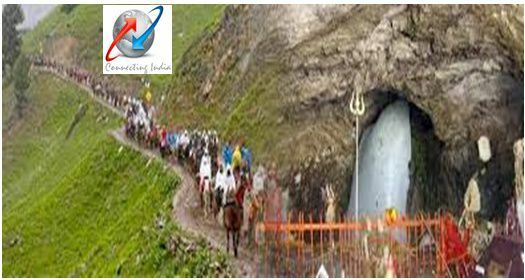 State runs Telecom Company Bharat Sanchar Nigam Limited (BSNL) has announced that it will soon be taking up the project for laying permanent Optic cable the entire route of Amarnath Yatra from Baltal to the Holy Amarnath Cave and from Chandanwari to the Holy Amarnath Cave. BSNL every year providing Prepaid SIM cards at Baltal base camp for devotees to make voice calls to their love ones while on the Yatra and ensure that they stay connected through BSNL network. BSNL has planned to enhance bandwidth on VSATs at Panjtarni, Holy Amarnath Cave and Seshnag from 1Mbps to 4Mbps and at Pashpatri to 2Mbps. Department of Telecommunication (DOT) has requested Defense department to facilitate OFC on a temporary basis until BSNL completes laying its fiber cable entire route of Amarnath Yatra. Under project expansion of network BSNL is installing more mobile towers at Pashpatri, Seshnag, Panjtarni and the Holy Amarnath Cave. BSNL is also planned to arrange Diesel power generators and batteris for the new BTS being installed.